Research suggests one in 12 older adults in Canada stopped filling prescriptions because of high prices. Feb. 1, 2017 11:00 a.m.
One in 12 Canadians aged 55 and older stopped filling their prescriptions because they were too expensive, suggests a new study out of UBC. The research, released Wednesday, draws on data from a 2014 survey of older adults in 11 high-income countries, including the Unites States, Australia, Germany, and Sweden. The survey ranked Canada second for most people in that age group skipping prescriptions because of the cost, at a rate of 8.3 per cent. Steve Morgan, UBC public health professor and senior author of the study, said these numbers are far higher compared to rates in similar countries, where fewer than four per cent of survey respondents reported skipping prescriptions due to cost. The U.S. had the highest rate of skipped prescriptions, at a rate 16.8 per cent. Canada is the only country among those with publicly funded healthcare systems that does not have coverage for prescription drugs, the study says. In a separate analysis, the researchers found that the rate is lower for Canadians aged 65 and up, with one in 20 people in that group not filling prescriptions. This group qualifies for public drug coverage in many provinces. In B.C., the provincial Medical Services Plan doesn’t base coverage on age, but on income from two years’ prior. Those earning less than $15,000 a year receive 70-per-cent coverage for each prescription filled. See PharmaCare assistance levels of coverage here. 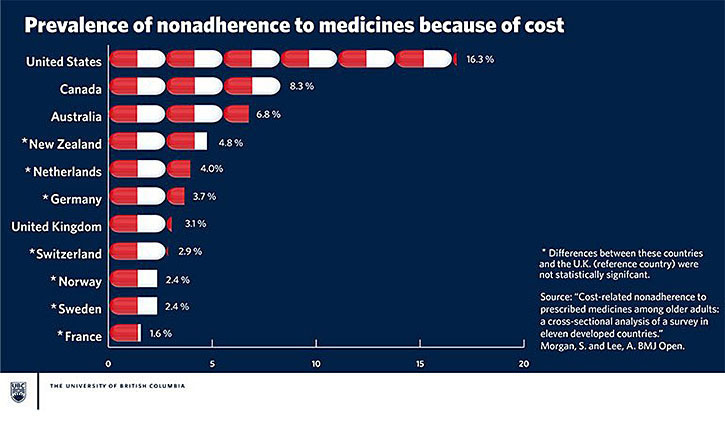 Canadians struggling to afford their medications might be cutting their pills, skipping doses, or looking to other ways to manage conditions without drugs, Morgan said, adding that gaps in funding prescription drugs are a barrier that is actually costing the healthcare system. He said the 2014 findings were consistent with studies that date back a decade.